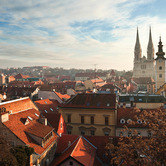 Dominic Burke, MRICS, is a valuation surveyor and head of Research for Jones Lang LaSalle in Croatia. Dominic has worked in Croatia and the region for two and a half years, specialising in valuation and consultancy, in addition heading the research department. Prior to joining JLL, he spent nine months working in asset management in London and three and a half years operating in the residential market in Liverpool, advising on a number of high profile schemes. Dominic is a qualified Chartered Surveyor and graduated from the College of Estate Management with a Post Graduate Diploma in Surveying.